Our students and benefit from frequent interaction with experts in numerous fields of law. The Faculty's many endowed lecture series bring a slate of notable speakers to campus each year. Each year, the Faculty of Law organizes a variety of seminars, conferences and workshops that are accredited for continuing legal education hours for jurists. Please consult our calendar of continuing legal education events. The Annie MacDonald Langstaff Workshops and the affiliated Margot E. Halpenny and Patricia Allen Memorial Lectures form a cycle of conferences that aim to explore the questions of, and intersections between, women and the law. Inaugurated in 1988 in honour of Annie MacDonald Langstaff, BCL 1914, the first woman to earn a law degree in Quebec, the workshops provide a forum for academics, judges, lawyers, and community activists to present scholarly research and practical insights on issues relating to women and the law. Two named lectures, the Margot E. Halpenny Memorial Lecture and the Patricia Allen Memorial Lecture are given each year as part of the series, in addition to three or four additional presentations. 25 October 2017: Beth Piatote - Animations of Indigenous Law in Louise Erdrich’s "LaRose"
6 February 2015: Joanne St. Lewis - Why does the Ferguson Discussion in the States Matter so Much to Black Canadians? 23 October 2009: Pearl Eliadis - Women's Rights as Human rights: How Are We Doing Today? 19 January 2007: Martha Jackman - Health and equality: Is there a cure? Margot Halpenny, BA'72, LLB'76, became a member of the Ontario Bar and spent the last ten years of her career working for Noranda as legal counsel. After her passing, donations poured in from friends in her honour. Her family felt that these donations would be properly directed to the McGill Law Faculty, given Margot’s educational background and the family’s overall strong affiliations with McGill. The Margot E. Halpenny Memorial Lecture honours her memory. 20 November 2013: Carissima Mathen - Are Women Bad for Multiculturalism? 14 March 2006: David Lepofsky - Achieving equality for persons with disabilities - What works? 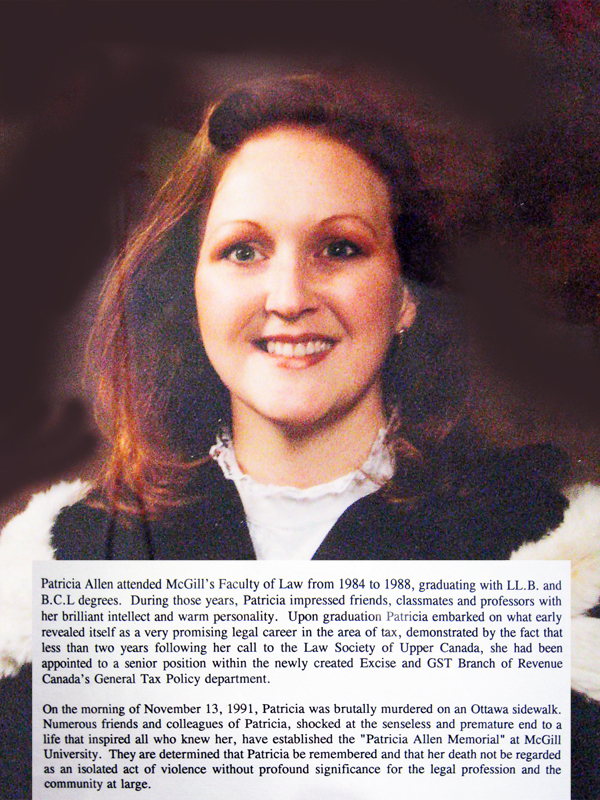 Patricia AllenCreated in 1992 by the Class of 88 in memory of Patricia Allen, a graduate of the Faculty who was tragically and senselessly murdered, this annual lectureship is devoted to sensitizing and educating the legal community and others about pressing social and legal issues related to violence, especially against women. Read an article about her in Contours, vol. 1 (2013). 20 February 2013: Beverley Baines - The R v NS Case: Why did the Supreme Court Change the Oakes Test? Several prestigious lectures in human rights are presented annually at the Faculty, such as the Raoul Wallenberg Lecture, the John P. Humphrey Lecture, and the René Cassin Lectureship. Many prominent human rights activists and scholars have come to McGill to present these conferences. The Faculty of Law also invites recipients of the Robert S. Litvack Award to participate in a public lecture at the Faculty. A bequest to McGill from law alumnus A. Maxwell Boulton, QC (BA '30, BCL '33) created the Boulton Visitors Program, which sponsors the visits of senior scholars and fellows to the Faculty. These visiting scholars and fellows offer courses and seminars on topics related to their specialties while working on a major research project. The Paul-André Crépeau of Private and Comparative Law runs a series of civil law conferences around broad comparative themes. Speakers either present scholarly work in progress or focus on issues of law reform in Quebec or curricular reform at McGill. The workshops provide a valuable forum for scholarly exchange, particularly among colleagues working in areas of Quebec private law. Alan Aylesworth MacnaughtonThe Faculty hosts each year, funded by endowments from the Classes of '75 and '77, made on the occasion of their 10th anniversaries. Launched in 1994, thanks to the generosity of Senator Alan Aylesworth Macnaughton (1903–1999), BA 1926, BCL 1929, LLD 1992, the bi-annual Alan Aylesworth Macnaughton Lecture is devoted to contemporary issues of public policy. Senator Macnaughton was Speaker of the House of Commons, founder and Honorary Chairman of the Canadian World Wildlife Fund, Counsel at Martineau Walker, and a member of the Faculty of Law Advisory Board. Other Faculty endowments and funds that bring lecturers to the Faculty include the Fern Gertrude Kennedy Jurisprudence Fund, established in 1987 to promote jurisprudence within the Faculty, and the McGill International Law and Practice Fund, which promotes the study of international trade and business law. The Faculty's principal seminar series welcomes eminent legal theorists present their work-in-progress to students and professors, often encountering vigorous exchange. The John E.C. Brierley Memorial Lecture on arbitration commemorates the life and work of John E.C. Brierley, who was Professor and Dean of Law at McGill. He was a prominent figure in the discipline of comparative law internationally and the leading Canadian expert on arbitration. See all the previous conferences on the Private Justice and the Rule of Law research group's web site. Every year, the McGill Dispute Resolution Lecture Series puts students in contact with noted international arbitration practitioners from most continents and many dispute resolution institutions from around the world. See all the previous lectures on the Private Justice and the Rule of Law research group's web site. The Seminar Series in Intellectual Property provides a forum for leading academics and practitioners in topics of interests in the field of intellectual property and technology law. These lectures bring together representatives of the Bar, the notarial profession, and the university in a distinguished forum to consider recent developments in the law. Past series have dealt with cross-border transactions, franchising, corporate acquisitions, and employment law. Since 1961, each year's lectures have been published in book form. The series was established to honour the late W.C.J. Meredith, QC, Dean of the Law Faculty from 1950-60. In 2006, the Meredith Memorial Lectures theme was Intellectual Property. In 2009, the theme was modern practice in an increasingly globalized world. Les professions juridiques sans frontières: Penser globalement, agir localement. Many additional lectures and colloquia occur at the Faculty every year on a variety of legal issues. Recent one-day conferences hosted by the Faculty have focused on aboriginal rights, constitutional change, and activist strategies for law reform. From time to time the Faculty invites distinguished legal scholars to spend time in the law Faculty, joining in McGill life and presenting a series of linked seminars. For over 20 years, the Wainwright Trust has sponsored a lecture series on the civil law.